In October, Google revamped Android with the KitKat version, but few devices run the newest software yet. In fact, web traffic data in North America suggests the update for KitKat is even slower than it was for the prior version of Android, Jelly Bean. According to a report from Chitika Insights published Friday, around 10 percent of Android smartphones and tablets in the study are running Android 4.4 or better. In the six months following the release of Android’s Jelly Bean software, that figure was 14 percent, Chitika says. Chitika’s data is taken from websites in the U.S. and Canada that use the company’s ad platform, so this information isn’t an exact detailing of the entire market. However, Chitika’s data pool is large; this report was captured from tens of millions of ad impressions using Chitika’s network between March 31 and April 6. In terms of device types, the data suggests that both Android(s goog) phones and tablets are getting updated or sold with KitKat at the same pace. Handsets running Android 4.4 accounted for 10 percent of measured web traffic in the study, while 10.6 percent of tablets used KitKat during the measurement period. I was a little surprised by the data, given that we saw some software updates available for Android 4.4 recently. Motorola has generally led the way, offering KitKat for both its Moto X and Moto G handsets as early as November. 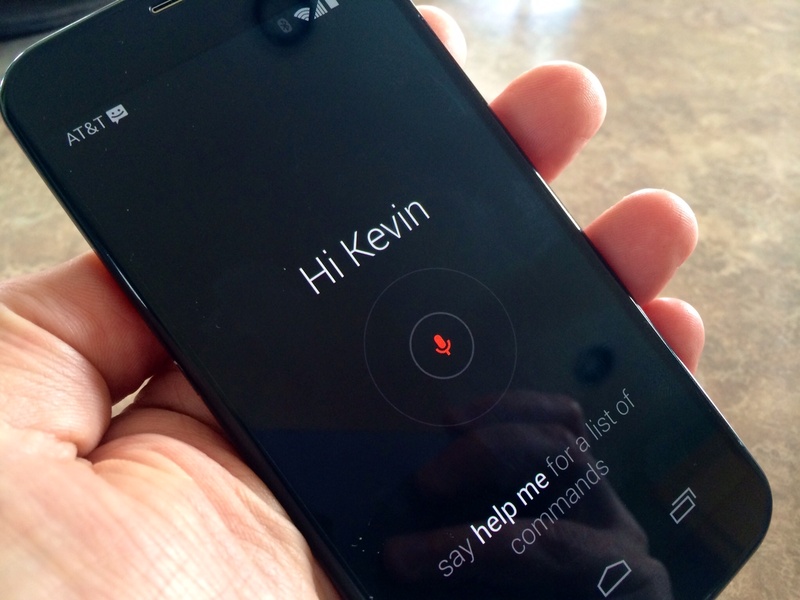 At this point, the four major U.S. carriers have all pushed KitKat to the Moto X. But one phone doesn’t make for a whole market, meaning there are plenty of devices from Samsung, HTC, LG and others that are still running Android 4.3 or older. 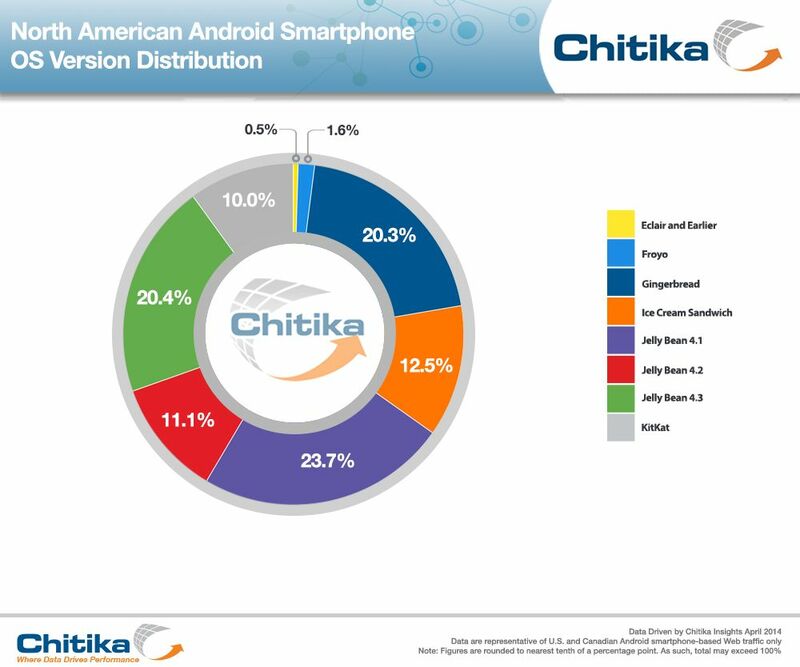 Google’s data gives credence to the Chitika report, showing even fewer devices are running Android 4.4. For the period ending April 1, Google’s own dashboard shows that just 5.3 percent of all Android devices visiting the Google Play Store are running the latest software. That too is a proxy for the information as devices could be running Android 4.4 and not hitting the Play Store. Additionally, Google’s data is global, not regional. It’s interesting, however, that Google shows 17.8 percent of Android devices are still running the old Gingerbread software, while Chitika’s numbers suggest that figure is 20.3 percent. Is this a huge issue or challenge for Google? Not any more so than the company has faced with prior versions. From a consumer standpoint, there won’t be much of a front-facing difference if devices are running Android 4.3 or Android 4.4. Developer frustration, however, could be a factor. Why create or evolve apps with some of the newest features available in KitKat when millions of devices can’t yet use them? Kitkat made my Nexus 7 tablet run significantly slower than when it had Jellybean. I actually downgraded it to 4.3 so that I could use it again. Checking the Kitkat features list on Google’s page confirmed that the minor list of actually new features (I don’t have a Nexus 5, so most of these don’t even work on my device!) were not enough to make up for the ridiculous performance drop and processor usage with Kitkat. I even did the update myself, downloading the build and flashing it to my device. Google needs to stop having so many pretty much nothing updates. If were one a year then vendors would only have to worry about pushing out 2 or 3 updates to a phone. They could even work with vendors so google announces a new version followed by vendors announcing their new hardware with the new version installed. Android 4.0.3 (ICS) is the system on my HTC Sensation. When I check about software updates, I am told none is available. Although the phone is a little more than 2 years old, one would believe it COULD be updated, so what is the problem? HTC has chosen not to update it any further. It would require them to devote resources to integrate Android with Sense for this particular model; unfortunately, this is very common – not every phone is provided with software updates, likely based on sales of the phone. On the plus side, HTC did provide a method to unlock the bootloader of that phone so if you wanted to tinker, you could likely install custom (read: non-HTC) software with a more recent version of Android. Android’s biggest flaw is it’s lack of support. Not regularly providing updates is it’s Achilles heel. I have a phone that is 2 years old (Galaxy Nexus) and it’s received 1 update and that wasn’t made available until 8 months after the update was released by Google. I’ve done one update manually, and I think I can probably take it up to 4.4 now but really, can the regular users out there handle that on their own? No. I’m waiting until an issue comes along that is as critical as Heartbleed to the mobile market place and then stand back and then watch Samsung fight to try and put out all the fires. I called Samsung in fact and asked them what they thought about the difference between their support and Apple’s and they said it was up to their marketing department to determine which phones got support for how long. So if you buy a phone that is incredibly popular, you’re ok. If you buy one that flops, you’re screwed. Like the S4 or Nexus. S4 still get’s updates in the US but not the Nexus. In fact, if you live in a market like Canada, you don’t get updates ever. Too few phones sold. BTW, thought I’d pose the question, but why is a tech site as astute as GigaOM still running Shockwave? Constantly crashing Chrome browser.